The Columbia Model 5648-X Single Channel Power Supply / Signal Conditioner provides a ruggedized unity gain interface between Columbia's 8000 or 900 Series Sensors or any competitors Acceleration, Pressure or Acoustic Sensors ith built in constant current powered electronics. The 5648-X provides a precision 4.0Ma constant current to the signal conditioning circuitry within the selected sensor. It also provides a 2 pole 12dB/Octave low pass filter and low impedance AC coupled signal output capable of driving up to 2000pF cable capacity. A second signal output is provided that is biased at +2.50VDC. The 5648-X eliminates the need for a complex abd costly current power upply and charge amplifier. The Model 5648-X requires a user-supplied source of DC voltage between +16 and +32 volts. The minimum voltage should be chosen at least six volts greater then the specific DC output bias level of the selected transducer. 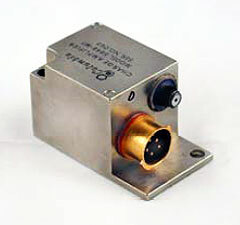 The 10-32 coaxial connector accepts the input from the sensor and power and signal outputs are available via a 5 pin Viking connector.